It’s not uncommon to find a midcentury modern, Frank Lloyd Wright-inspired home that embraces nature — after all, that was pretty much Wright’s forte. And this week’s historical shelter definitely embraces that yen for nature the famous architect’s work inspires. And even better, it belongs to a SecondShelters.com reader. Pat Wood wrote us this month to tell us about her home — Kittatinny Manor, located along Eastern Pennsylvania’s Kittatinny Ridge, which is part of the Appalachian mountain range. The Penfield House was designed by the venerated Frank Lloyd Wright, and was one of his last designs before his death in 1959. Frank Lloyd Wright aficionados who are looking for some income property can hit the jackpot with the Penfield Home, located in Willoughby Hills, Ohio, and situated on the Chagrin River. 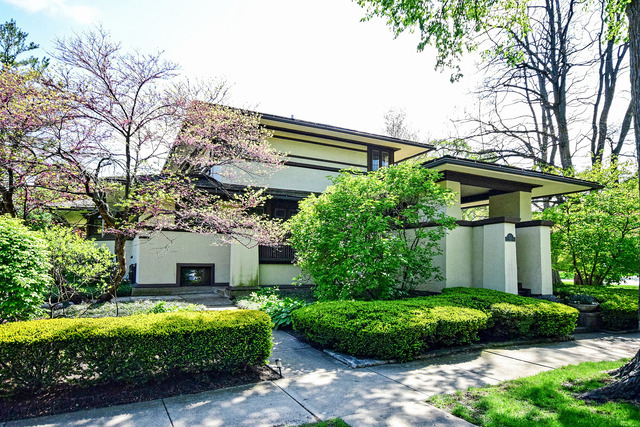 Own a Frank Lloyd Wright Prairie Home in Elmhurst, Ill.
Often when I write about second homes, I’m writing about areas to consider. This time I’m dictating exactly which second home you must purchase. I’m doing this because it’s one thing to impress your friends by owning a second home, but it’s a complete mic drop to add that it’s a Frank Lloyd Wright prairie style home. John Rattenbury Mid Century Masterpiece Brings Taliesen West Sensibility to Dallas. And Oh So Reduced! I am not going to tell you how much this home at 9100 Guernsey is listed for — because my lawyer has not yet drafted any releases to cover reader heart attacks. (Well, I guess you can always look it up.) This masterpiece is about as close to owning a Frank Lloyd Wright design in Dallas that you can get without actually BUYING the Frank Lloyd Wright home a few streets over on Rockbrook, which is owned by Michael and Elysiann Bishop and $10 million. It was designed by Wright’s protege John Rattenbury, who designed Life Magazine’s House of the Year in 1997. Rattenbury, of course, studied under Wright at Taliesen West, and was Wright’s apprentice and senior architect. But here’s the beauty of this home: it was built in 1992. The Bishop’s home was built in 1954 and as gorgeous as it is, honestly, there are always headaches associated with a home that age. I mean, that’s almost as old as I am and I certainly create MANY headaches. So you get this exquisite, pure Wright sensibility right down to the stainless steel counters in the kitchen. But you still get new — the soaking, marble-surround tub in the master, the flowing floorplan, all immediately from the front door entryway with large planter box and skylights. The living room has floor-to-ceiling glass viewing the wooded grounds. The kitchen is decked like nothing Wright could have imagined, with Gaggenau and Sub-Zero appliances, and is open to the living room and dining room. Of course you view the graceful pool and grounds from every window. The master has a raised ceiling, sliding-glass doors that open to a terrace, a fireplace, a wet bar and built-in cabinetry. The master bath is very updated, opens to a private courtyard. You get a study with walls of bookshelves, a fireplace and more glass. In true mid-century fashion, three secondary bedrooms offer generous natural light and ample built-ins. What I particularly like about this house is the size — just right by 2011 standards: 4121 square feet is perfect, located on 1.1 acres on a wooded, thickly treed cul de sac skirting the estate area of Bluffview. So all that — architecturally significant, beautifully maintained (full disclosure, I know the owners and they are as OCD as they come) and stunning. The interiors are by Rattenbury’s wife, Kay, who lived and studies with the Wrights since she was 14. Land. Trees. Water. This home was originally listed for $1.9 back in January but has been reduced to — $1,499,000. Anyone want to buy my house? Because this is a deal. I just had a thought: what would Frank Lloyd Wright been like on Twitter?